Wash the Velvet Apricots, cut them in half, and discard the pits. Heat them skin side down on a medium-high grill for about 2-4 minutes. 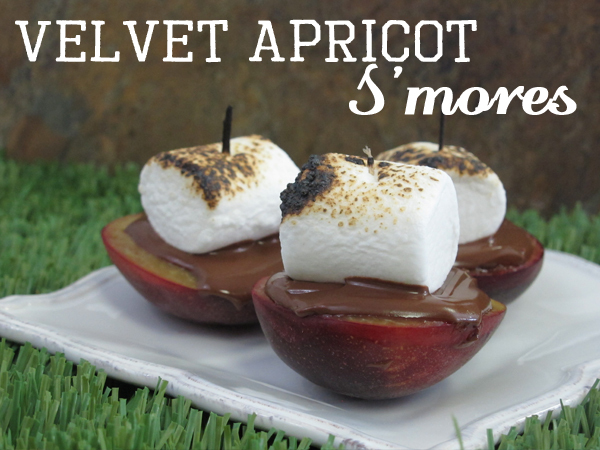 Grab them off the grill, top with a chocolate square and half a marshmallow. Spear through with a toothpick. Place a piece of aluminum foil on the grill. Return the smores to the grill and let sit until the chocolate begins to melt and the top of the marshmallow begins to turn golden brown. Take a bite, and be ready for AMAZING!